The aptly-named High Point is located just off I-84 as it briefly passes through extreme northern New Jersey. As such, it made a great little side trip during our 2015 road trip to New England. Surrounded by a state park, and actual summit area is topped by a 220-foot monument to veterans and the Appalachian Trail passes within a quarter mile of the summit. While not as impressive as some of the State Highpoints to the north, it does offer excellent views in all directions. We left Pittsburgh early in the morning as part of our road trip, and made it to High Point just after 1pm, in time for a late lunch. After paying the $20 non-resident, summer, weekend visitor fee, we drove through a very busy High Point State Park to the monument parking area. The weather was clear, but a bit warm, and we were lucky to grab the only shaded picnic table near the parking area. After a brief lunch, we set off to visit the highpoint and monument. 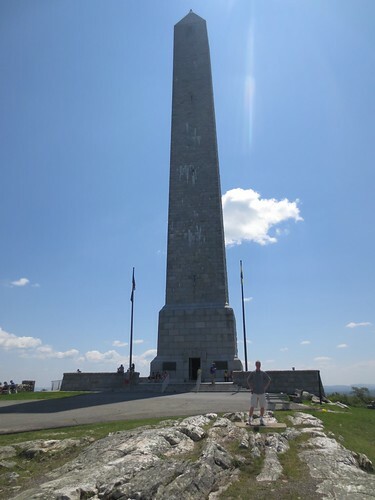 A large limestone obelisk, the summit tower is open during the day, and we started to climb it as a family. By the time we reached the first landing inside the tower, only our 8-year-old daughter decided she wanted to continue. The climb wasn’t particularly hard, but the higher we went, the more humid and stale the air in the tower got. We stayed at the top very briefly, and quickly made our way down the stairs to fresher air outside. While not as spectacular as other highpoints we’ve been to, High Point, New Jersey was a pleasant stop at the start of our trip. The area seemed like a nice way to escape the urban centers of the East Coast for an afternoon of hiking, and if we lived closer, I could see spending more time there in such pursuits. After taking a few more pictures, we loaded the kids up in the van and continued on our trip, making a stop at the Home of FDR before staying the night in Rutland, Vermont on our way to Mount Mansfield and Katahdin.